The book begins with an Easter bunny, in yellow paisley tails and purple vest, backed by a star studded sky, gliding low and gently dropping Easter eggs from his basket onto a grassy meadow. He places a chocolate chicken, wrapped round with a pink ribbon, in an empty birdbath. Max stares at the chicken with a look of weak-kneed rapture and proclaims his love. Enter Ruby, his older sister, who interrupts his lovestruck revery to lay down the rules. The Easter egg hunt is to be a competition. Winner takes the chicken. She admires each colorful egg she finds. Max delights in floating his basket in a mud puddle, collecting acorns, following a trail of ants. While Ruby, Midas-style, counts her eggs, Max slips away. When he emerges from his hiding place, mouth covered with telltale chocolate, Ruby remonstrates. “’Max……how could you do this to me?’” Behind her back, we see the Easter Bunny’s hand slipping a chocolate duck onto the birdbath. The book ends with Max’s protestation of love to a new object of desire (and we see that he has already broken off the tail). Max’s Chocolate Chicken is one in a series of over two dozen Max and Ruby books. Ruby, usually well-intentioned, sometimes self-serving, tries to impose her agenda on her younger brother. Indifferent to her priorities, Max always succeeds in following his own very different agenda, quietly making an end-run around his sister’s plans. There is neither animosity nor rancor in their relationship. There is much humor, however, as we watch Ruby persist, over and over, in her wrongheaded belief that she can prevail. 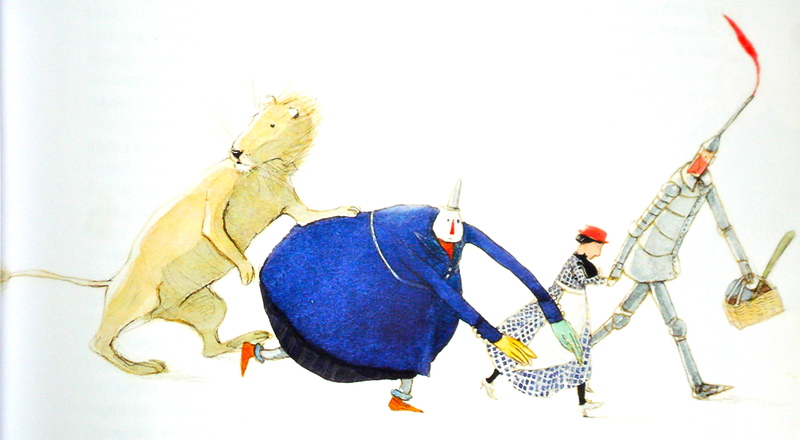 Rosemary Wells is a brilliant humorist, the best there is in the picture book world. She learned what she needed to know about comedy and timing from Sid Caesar and Jackie Gleason. Her touch is deft and fresh, subtle and intelligent. Her amazing gift is the ability to appeal equally to children and adults – and the humor never stales, despite endless readings. Who else can claim as much? The storylines ring true (the siblings were based on the author’s daughters, Beezoo and Virginia), the writing is succinct and clever, and the illustrations create humor through minute shifts of mouth or eye that perfectly express characters’ feelings. 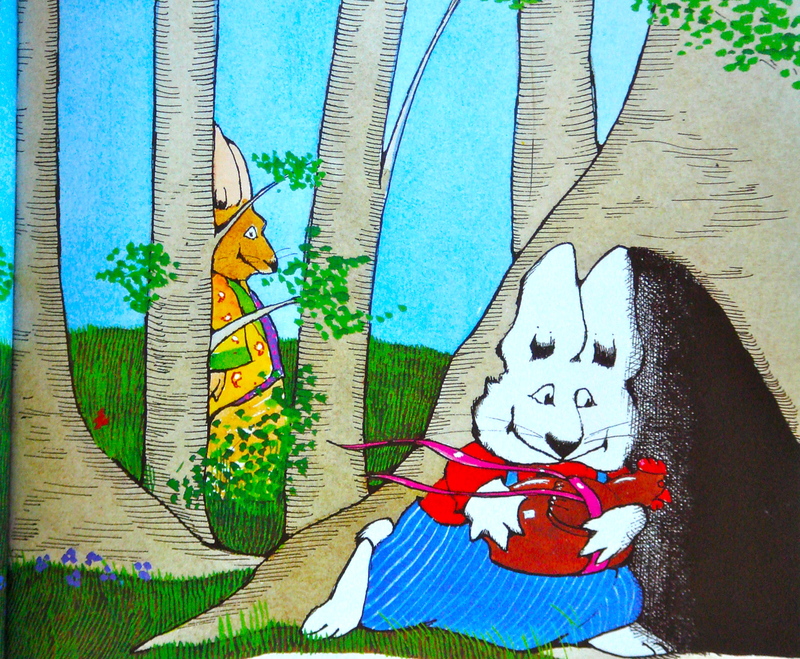 Max and Ruby are bunnies, but that is incidental. With the notable exception of the white West Highland terrier who stars in the McDuff series, the world according to Rosemary Wells is filled with skunks, guinea pigs, raccoons, kitties, dogs, and ducks, all wearing clothes and behaving like people. Aside: “Drink your milk, Fritz,” said Fritz’s father. so that it would turn a weird color. “Something’s wrong with it,” said Fritz.